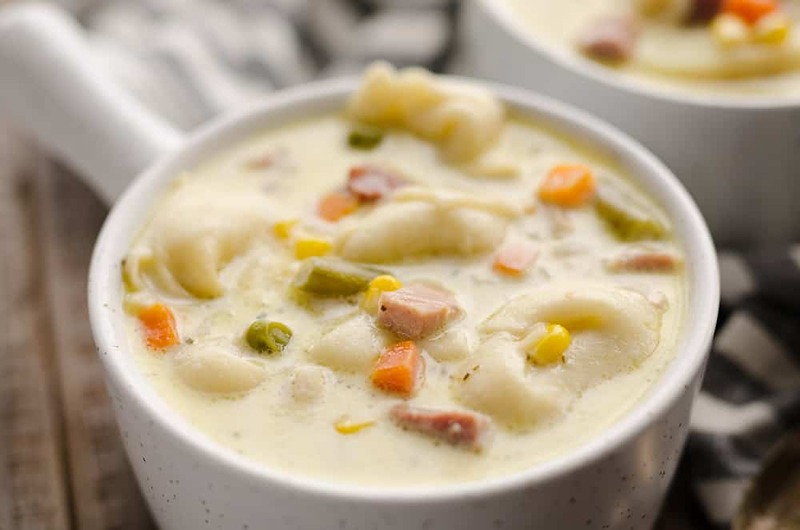 Pressure Cooker Creamy Ham & Tortellini Soup is a quick and easy 20 minute Instant Pot recipe using leftover ham, frozen vegetables and pasta. I’m coming at you with yet another recipe for leftover ham. If you are anything like my mother, you make a ham that is about three times bigger than what you need. After all the holiday meal is cleaned up and ready to pack away, you realize you have more ham than you will ever know what to do with! These Ham & Three Cheese Twice Baked Potatoes are a great way to use up your ham if you have an Airfryer. 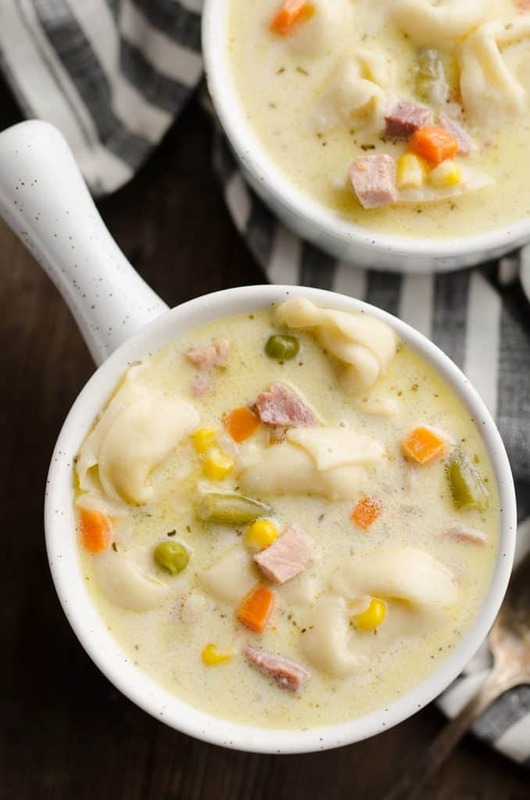 If you are an Instant Pot owner instead, then this Pressure Cooker Creamy Ham & Tortellini Soup is where it’s at! This easy 20 minute recipe comes together in an instant. Simply saute some onions and garlic in butter on the saute function in your electric pressure cooker. While those are cooking up for a few minutes, dice up your leftover ham into small pieces. 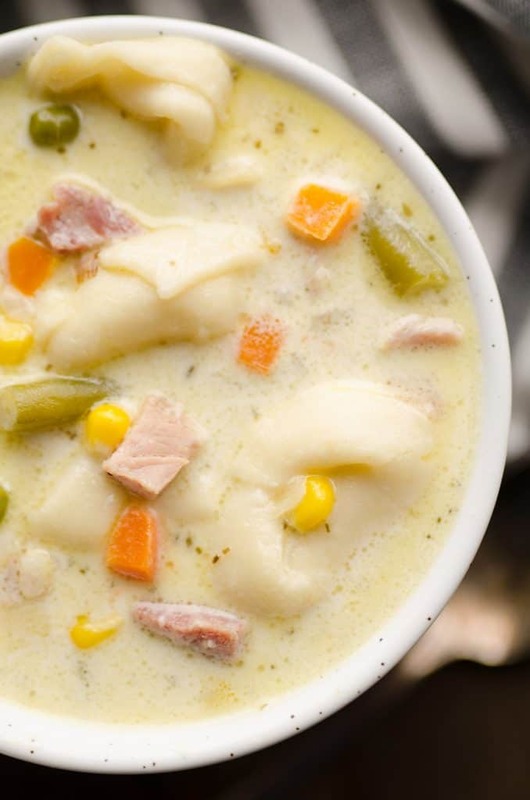 Add the ham, along with some frozen vegetables, cheese tortellini, chicken stock and a little rosemary to your Instant Pot. The frozen bag of vegetables and frozen tortellini make this recipe particularly easy. It is important to use these frozen items because they take a bit longer to cook. If you were to swap out fresh pasta or vegetables for these, they would get overcooked and mushy. Pop the lid on and be sure it is turned to ‘Seal’. Set the manual timer to high pressure for zero minutes. Yup, you heard me right. Zero minutes. You might be wondering why you would cooking something for zero minutes, but in reality it is cooking for almost 15 minutes as it builds and releases pressure. Therefore, it is important to release the pressure as soon as the timer beeps indicating that it has come to pressure. Once the pressure is release, stir in the heavy cream and Parmesan cheese. 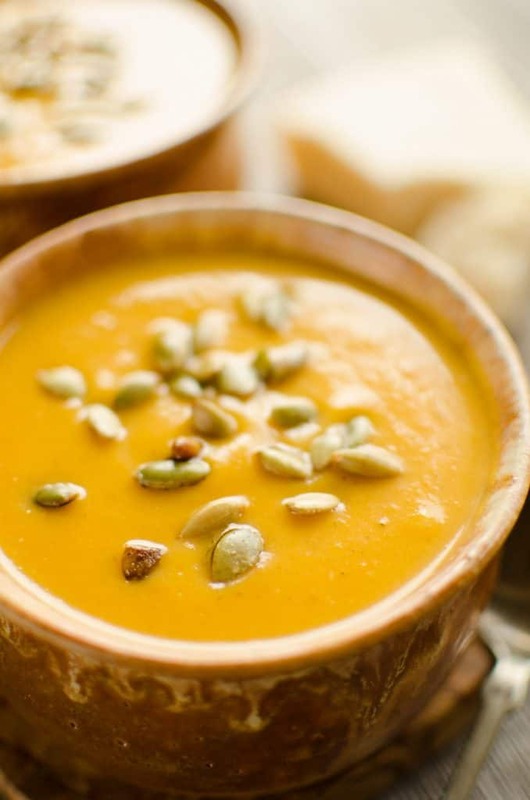 While the soup will be tempting to try right away, be sure and give it a little time to cool down in your bowl first. The Instant Pot gets food extra hot from being under pressure. It’s never any fun burning your tongue! 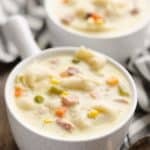 Enjoy a bowl of this warm and hearty Pressure Cooker Creamy Ham & Tortellini Soup with some crushed crackers on top and you will have an easy dinner recipe the whole family will love! Turn your electric pressure cooker on to saute and add the butter. Add the onion and garlic to the melted butter and saute for 3-4 minutes, or until the onions are translucent. Stir in the garlic salt and bouillon. Release the pressure as soon as it beeps and comes to pressure. Stir in the cream and Parmesan. Serve topped with crackers. 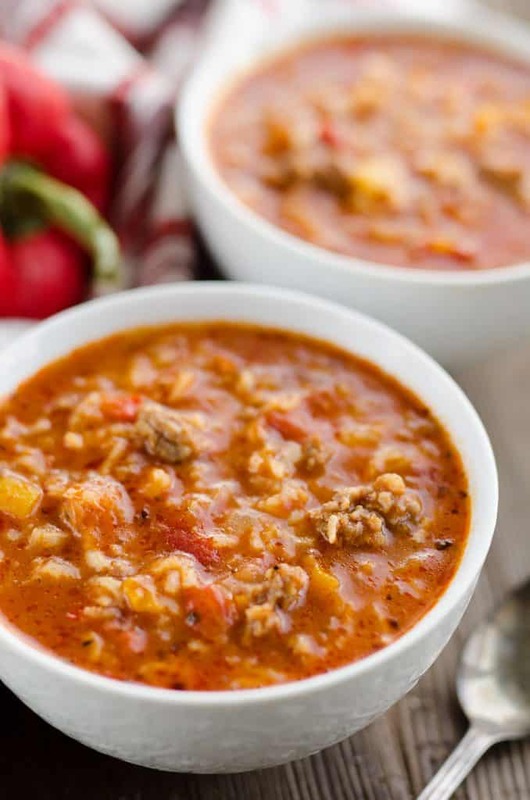 More Delicious Pressure Cooker Soup Recipes! PERFECT comfort food for this make shift winter we are having in SPRING!!! Yum!! I can’t wait to try it!! I have a little leftover ham! I love this recipe! Zero minutes is awesome! And I can almost taste the rosemary now. Yum! 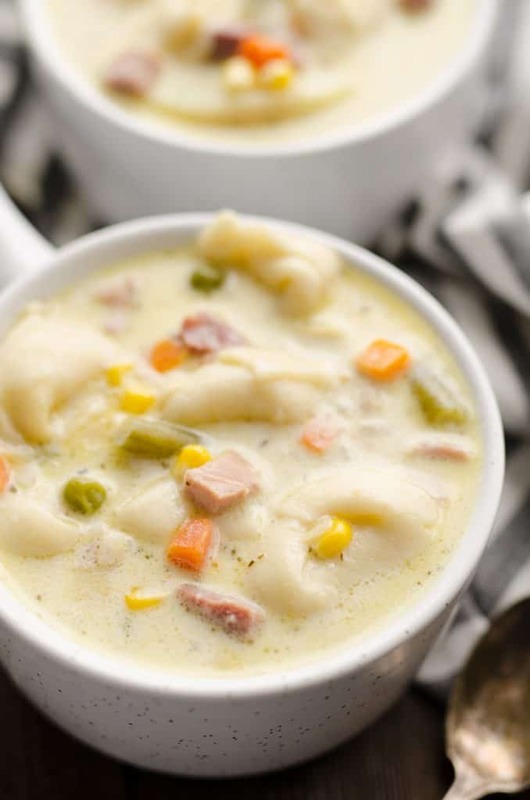 This soup looks so delicious and a perfect way to use up any leftover ham!! 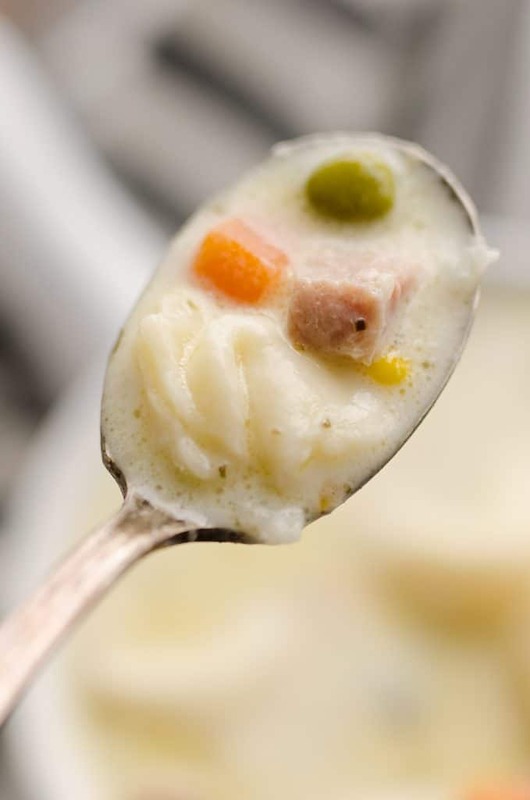 I made this recipe yesterday, it was the BEST soup I have ever had!!! 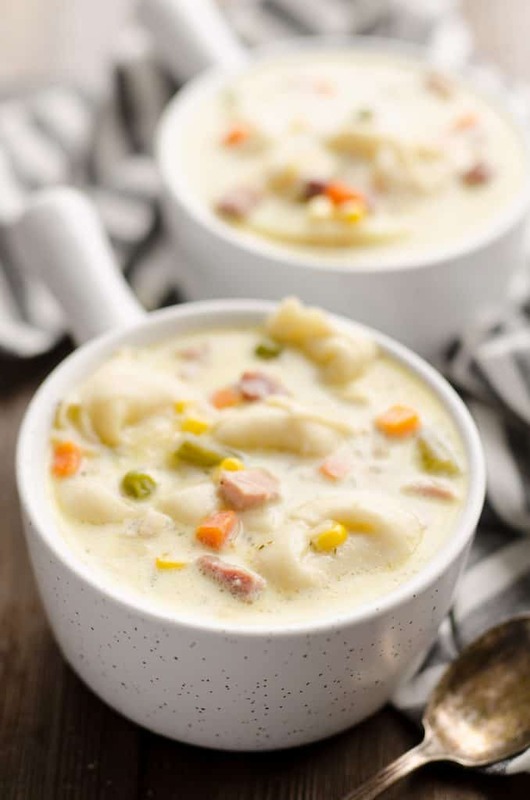 This will certainly be in my rotation of instant pot soup recipes 🙂 1000 stars! !